Spread over a number of picture perfect islands and elevated on the Olympus Massive, lapped by the emerald sea and topped off with the azure sky, Greece continually bombards the senses with multiple sensations. Whitewashed houses and traditional coastal taverns abut mind-blowing ancient ruins and staggering natural treasures. The sun never fails to caress the body and the sounds of Zorbas warm your blood. Greece embraces graphic mythology, valiant history, the glorious roots of philosophical thought, and the early days of Western drama, but also the cherished ideals of togetherness, the joy of life and its simple pleasures. Following some research into the preferences and opinions posted by users of various social media sites, such as Twitter and Facebook, as well as own resources and reviews by the most popular travel sites, Open Travel has compiled a list of top 25 things to see or do on your Greece Vacations. These destinations are but just the tip of the Olympus, but they adequately capture the magical ambiance of this adorable country. Add to it all the cultural aspects that every single corner of Greece conveys in excess, and prepare for the experience of a lifetime. Newly-weds choose this Greek piece of heaven to cherish their wedded beginnings. No wonder, Santorini is an idyllic destination to inhale heavenly bliss. 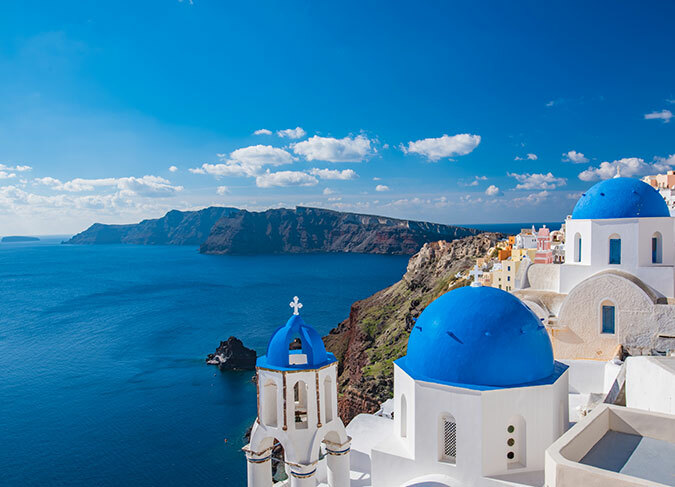 Perched on the cliffs of a volcanic caldera (crater) it stuns with picturesque views of typically Cycladic white-washed homes and blue-domed churches. The beauty of the multicolored cliffs, deep-blue water and spectacular sunsets makes even the most been-around travelers succumb to its drama. Choose the west coast for more celebrity upmarket settlements or the east if you are on a lower budget. Most importantly, make sure you take some spare memory cards for your camera for pic-taking is rather compulsive here! Visible from any corner of Athens, the Acropolis rises high and proud. Crowned by the internationally-renowned Parthenon, it manifests the unsurpassed grandeur of the Ancient civilization. Built entirely of marble, the temple used to house a giant statue of Athena, the city patron goddess. No visit to the city is complete without climbing the rocky crag. Stone-paved paths will lead you to a plethora of white Doric columns, monuments and temples gleaming in the sunlight. Brilliantly illuminated at night, the Acropolis is a magnificent view you shall never forget. Seeking retreat from the expanding Turkish occupation, the Eastern Orthodox monks found a perfect asylum here. Inaccessible rock pillars scattered over this uniquely sculpted landscape along with caverns and tall terraces provided an ideal place for spiritual contemplation. Although more than twenty monasteries used to perch on the steep rocks, only six remain today constituting one of the most important complexes in the country. ‘Suspended in the air’ as the name translates, the monasteries are accessible only by steps cut into the rock formations. So up you climb contemplating earthly matters, but first of all, the impressive views! Vibrant with cosmopolitan atmosphere, celebrities and fashionistas, Mykonos will party you crazy into the night. Once notorious as a hangout for the narcissistic and gay who paraded around the main town’s harbor, this most popular Cyclades island seduces holidaymakers with its frantic vibe of hustling streets, music and oiled-up bodies. The minute you get tired of the jostling beaches and bars, head for Mykonos’ Little Venice to delight in winding streets, colorful balconies and other charming hideaways. At least a glance at the Sanctuary of Asklepios at Epidaurus is as obligatory as at least an attempt to climb the Acropolis. But the odds are high that once you see one of the purest masterpieces of Greek architecture – a healing and cultural center dating from the 4th century and dedicated to the god of medicine – you’ll feel like doing everything but leaving, especially on being struck by the ancient splendor of the Theater. Take a rest up high on the ancient stone seat, marvel at the intact Orchestra reaching 20 meters in diameter, imagine who might have been sharing your limestone spot hundreds of years ago. Unmissable! However picky you might be, there is a sunny pit to suit any taste on Crete. From secluded beaches with the softest of white sand and enchanting coves with glistening colored pebbles to vast stretches of sandy gold and rocky coastlines, there is anything a true sun-lounger can dream of. Sand castle building with the kids? Just grab your spade and bucket and hit the Chrissi Akti or Agia Galini. For a little bit of pose and naked bodies show-off face the sun at Paleochora beach or just fancy your summertime laze on the most popular, palm-fringed Vai Beach, Crete’s own glamorous Palm Beach. And when you feel the need to stay off the sun for a little while, lose yourself in the labyrinth of the magnificent Knossos Palace. Acclaimed as the center of the Earth and Universe, Delphi has always been a place of historic and spiritual significance. The ‘navel of the world’ where the omniscient Oracle was to be advised blends harmoniously with the magnificent landscape and it surely is an absolute must destination for any history lover. Although the eternal flame is no longer burnt inside, a visit to the Temple of Apollo is obligatory. It is enough to consult the Opentravel.com and not Pythia to know that there are numerous sites in Delphi to explore including the Athenian Treasury, the Theater and the Stadium as well as the Tholos and many, many more. Gliding over the uncovered area of the lake in a boat is enough for many to go ecstatic about the magical quality of ultramarine water and monumental walls all around it. Then the gondolier circumvents a small fig-covered island and continues inside the roofed section through a narrow passage. It is here that an ancient lantern was found in 1951 giving rise to further successful excavation projects, and ultimately to the partial collapse of the inner cave’s roof. And regardless of whether you gaze down from the edge of the cliff or observe the spectacle of light and water from within the cave, you will surely admit it was an extremely lucky accident. Sensations not to be described in words! Want to see how the nature and the hands of a humble man have worked in a perfect unison to create an awe-inspiring view? If so, hit the artificial Thessaly Lake of Plastira. Immersed in oak and chestnut trees, it will soothe your senses with scenic views, rustling leaves and murmuring water. The resort offers endless action-packed opportunities for holidaymakers from rambling and horse riding to water sports including canoing or rafting. Add to it the countless surrounding villages – all abounding in folklore peculiarities – and you’ve got a must-visit destinations that has brought prestige not only to Karditsa region but to all of Greece as well. Truly enchanting! High above the modern town of Mycenae, between two conical hills, spread the ruins of by far the most powerful and influential palatial complexes of the Late Bronze Age in Greece. Dating back to around the second millennium B.C., its legends have inspired artists to date, from the Homeric epics and the Classical tragedy to vivid reflections in the contemporary art. Look at the scarce remnants and let it occur to you that the bulk of Greek mythology has its roots here in Mycenae. Once you walk through the Lions’ Gate you witness the abduction of Helen, become part of the Trojan drama, bite the Golden Apple of Discord, and face the prophecies of Cassandra. A little bit of imagination will work miracles. Reached by foot or Lindos’ popular taxi, the donkey, the Acropolis dominates the view with sugar cube whitewashed houses nestling on the slopes and the 4th century BC temple of Lindia Athena surrounded by a medieval castle. Once you quench your thirst for history, enjoy an invigorating swim in the crystal waters of the Lindos Bay or a relaxing sunbath on Tsambika beach famed for its golden sands and turquoise waters. Located under an imposing rock with a miraculous monastery atop, the beach is a hot spot to charge your traveler’s battery! Mount Olympus is where life blends with mythology and the idealized archetypes with the aspects of the multi-faceted human psyche. Any climb to Mount Olympus starts from the town of Litochoro, Traditionally regarded as the imaginary abode of the Greek gods, it inspires respect not only by virtue of its height (the highest peak cuts the sky at 2,919 meters), but primarily by its divine mystery. It is here that Zeus mounted his throne, Hades remorselessly ruled the Underworld, and Poseidon rocked the seas. And although the myth of Sisyphus cursed to endlessly roll a giant boulder up a hill, or Prometheus, bound to a rock and having his liver eaten by an eagle seem nothing but fairy tales, a strenuous climb up the range may well give you a creepy shiver running down your spine. An ideal place to sail in and sail from is the Pythagoreion of Samos, the ancient fortified port which bewilders with a picturesque harbor and an impressive architectural structure of the Eupalinian aqueduct. Quintessentially Greek with yachts of all sizes, taverns and bustling harbor life, it definitely is the place to anchor for a while. But beware! As the nautical guides say, the southerly storms in springtime and autumn wash pretty big waves over the mole. To avoid crashes and scratches, steer safe captain! The most northern of Ionian Islands, Corfu makes a dream family destination. With the country’s best climate, both the island’s vegetation and tourist figures flourish. Although partly overrun with low-budget hotels and loud discos, it still retains a lot of charm in places like Kassiopi or Palaiokastritsa where you can stroll down pebble beaches or just watch the world drift by from one of numerous fish places. For more refined tastes Corfu offers Sissi’s Palace located in Achilleon. Set on the mountain top and surrounded with a breathtaking garden, the palace is an impressive classical style monument with a waft of Austro-Hungarian flair. Infamous among the locals (bears and wild boars protected in the Vikos Aoos National Park happen to feast on farm animals), the stupefying Vikos Gorge inspires exclusively positive connotations among tourists. As befits the deepest gorge in the world – although some opt for Grand Canyons superiority – the vistas that unveil just about anywhere you point your camera are bound to leave you speechless. Leading a long way through adorable villages tucked into the lush, rolling scenery and Byzantine monasteries, past walls of up to 1 km in height, and over the 18th century stone bridges, the hiking trails are not only a good deal of physical workout, but also a magnificent spiritual experience. If you think that grapevine is the symbol and attribute of Dionysus, a visit to the archaeological site of Delos will surprisingly prove you wrong. And when we say surprisingly, we really mean business. When you reach the platform of the Stoivadeion dedicated to the god of wine and the life-force, you’ll surely notice on either side of the platform a pillar supporting a colossal phallus. But lest you limit your interest to this site and only, the sacred island of Delos is a goldmine of landmarks. Serving as a holy sanctuary long before the Greek mythology made it the birthplace of Apollo and Artemis, it features such splendid sights as the Minoan Fountain, the Terrace of the Lions, the Doric Temple of Isis, and the age-old Synagogue. To be on Peloponnese and give up on Dirou Caves is like being whiskers away from asking your perfect partner for a phone number and chickening out at the last moment. Life will go on but you will always feel you’ve missed something irreplaceable and unrivaled in its kind. Once you board a small wooden ferry, a whistling gondolier will make it glide effortlessly over crystal clear surfaces, steer into the underground space meandering gracefully through the glistening bodies of stalactites and stalagmites, along narrow passageways dimlit with halogen lights and revealing such unearthly colors that you could swear the place was hand-painted. You’ll raise your head up high to marvel at the lofty ceilings, only to bend it low as you squeeze through slim openings in the rock. Feels like descending into the heart of the Earth. A careless glance at the Charilaos Trikoupis bridge could make you believe you’re in San Francisco. The monumental structure crossing the Gulf of Corinth and linking Peloponnese to mainland Greece is a feat of engineering and a curious element of modernity in the historical amalgamation of ancient sites, quaint towns, romantic ports, and soothing beaches scattered along the edge of the Gulf. A place catering to all sorts of tastes as the multitude of spots to explore allows you to change your mind without due deliberation. Just toss away your guidebook and follow your instincts. Don’t forget to peep down the Corinth Canal, though. It’s curious that people who love to eat this much have what has been labeled the healthiest diet in the world. Greeks certainly appreciate the pleasures of eating, and they know how to do it well. Spending any amount of time in Greece entails succumbing to the magic of smells, tastes, and colors, but most importantly, this culinary revelry comes with endless opportunities for enjoying food in unbelievably inspiring, picture perfect settings. You’ll be truly spoilt for choice, and tracking down a place where you can gobble your seafood and hear the humming of waves in the background is not really a problem. Yet if you happen to be around Plakias, do try Taverna Christos. It’s as Greek as can be and it’s value for money. Besides, just have a look at this romantic, tamarisk-shaded terrace…Bon appetit! Tired of choking on fumes, buses jammed nose to tail in traffic, and risking your life to get to the other side of the street?You certainly won’t find much solace in Greek metropolises, but there is one place where this nuisance melts away like the morning dew under the warm rays of the Mediterranean sun. Along the hospitality of the inhabitants, the excitement of nightlife and the highly cosmopolitan aspect, the picturesque island of Hydra is characterized by the absolute absence of vehicles. Get in the saddle to pick up the morning paper (just choose between a horse and a donkey, cycle to the grocer’s, walk the steep stone streets leading up and outwards from the harbor area, and use a water taxi to jump from bay to bay, and one natural harbor to another, sampling the best of maritime culture and marveling at the clusters of red-tiled houses rising from the Aegean Sea. Exiled on Patmos by the Roman Emperor Domitian around 95 AD, St. John the Theologian, commonly identified with the Apostle John, is said to have received his divine visions in what is today called the Cave of Apocalypse and where he is believed to have made his home. Surrounded by a large monastic complex with flower-laden yards, chapels built on different levels, carved domes, and intriguing cells, the Sacred Cave proves a mystical place to the believers. Yet if this is all too far-fetched for you, head to Chora, the island’s historic center, declared a World Heritage Site by UNESCO. Walk its cobblestoned narrow streets to the port and back, past impressive stone mansions and whitewashed houses that cutely envelop Saint John’s castle-monastery sitting atop the hill. This is where the purity of faith blends with the charm of traditional values, mighty history and the sheer beauty of the Dodecanese. When you look at it from a distance, you could swear it’s the Rock of Gibraltar. As a matter of fact, it is a medieval fortress-town of Monemvasia sprawling at the foot of a giant rock protruding from the depths of the sea and connected to the mainland by a 200 meter long causeway. Having witnessed both the splendor of Byzantine heyday and the drama of war, Monemvasia is a place where one inhales history and exhales admiration. The juxtaposition of 12th and 13th century churches, Agia Sophia being the most striking example, and the sheer charm of Laconian settings makes the time flow at a less frenetic pace. Ladadika is what remains of the notable Jewish quarter whose population did much to develop Thessaloníki’s culture and commerce. After the Nazi put a tragic end to the community, the area gradually developed into what is now a trendy spot to hang out with friends. It does represent a nice break from all major landmarks with its vibrant colors, winding narrow streets and endless taverns to sip on some ouzo. Walk from Ladadika along the seafront to experience a never-ending party. And for those who find interest in architecture, Thessaloníki is a real feast of Paleochristian and Byzantine design, of which Hagia Sophia is the most exquisite example.